Don’t these cupcakes just look too pretty to eat? Well, even though they do, you won’t have any regrets after eating them. The moist chocolate cupcake and rich blackberry frosting pair beautifully, creating a real treat that you’re sure to love. So, appreciate the beauty of these cupcakes, and then enjoy every sweet bite. And feel free to share the recipe with friends and family on Facebook, Pinterest, Instagram, and Twitter. Ready to start baking? Gather all the ingredients listed in the recipe below, preheat your oven to 350°F, and line a cupcake tin with paper liners. For the cupcakes, begin by melting the oil, unsalted butter, and chocolate chips in a microwaveable bowl, and set aside. In another bowl, mix the flour, baking soda, baking powder, cocoa powder, and sea salt together, and set aside. In a third bowl, whisk the eggs, yolk, sugars, and vanilla together. Then add in the butter mixture and whisk until smooth, add the flour mixture and Cabot Plain Greek Yogurt and mix until just combined. Finally, add the coffee. Fill each cupcake liner to the top to obtain the big and lovely cupcakes as pictured and bake for 18-20 minutes, or until a toothpick inserted into the center of a cupcake comes out clean. Cool completely. While cupcakes are cooling, make the frosting. With a food processor or blender, puree the blackberries and then strain the puree into a small bowl using a fine mesh strainer. In a large bowl, use a hand mixer to whisk the unsalted butter, powdered sugar, and salt together until combined. 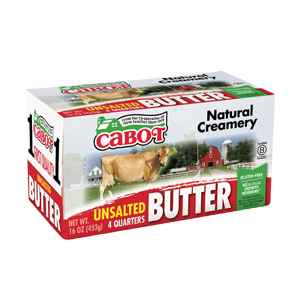 Then add Cabot Cream Cheese and mix until nice and fluffy. Mix in the blackberry puree and refrigerate frosting for approximately 30 minutes. Once cupcakes have cooled, decorate with frosting and add a fresh blackberry on top for a garnish that adds the perfect finishing touch! When you’re in the mood for blackberries and a refreshing smoothie, try our Blackberry Grapefruit Smoothie. Delicious on its own for breakfast or as a snack, it would also be a treat to have with one of these yummy cupcakes! 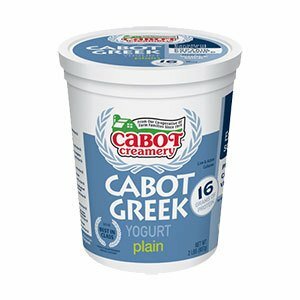 Cabot is a cooperative of over 1,000 farm families who work together to bring you the highest quality products around. 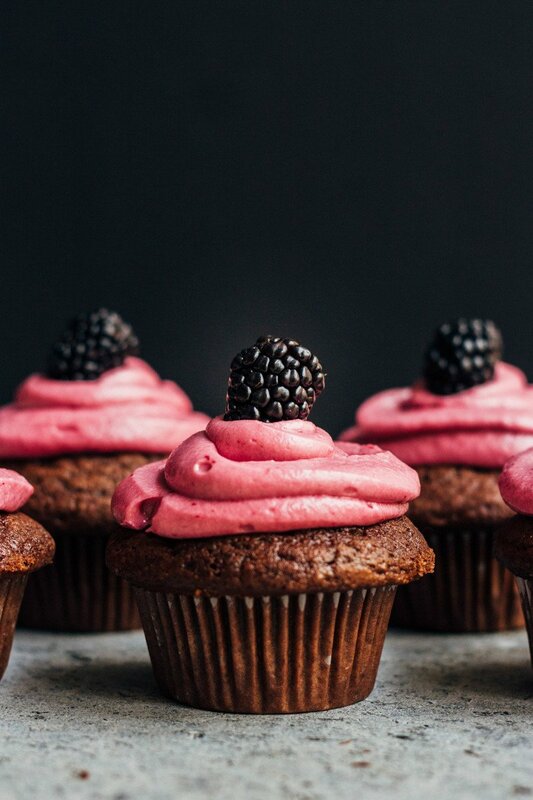 We’d love to hear your feedback on these Greek Yogurt Chocolate Cupcakes with Blackberry Frosting, so please rate and review the recipe after giving it a try! LINE a cupcake tin with liners (I lightly spray the liners with non-stick spray). MELT (in a microwavable bowl) the oil, butter and chocolate chips for about one minute, and then use a rubber spatula to stir until smooth. Set aside. MIX, in a separate bowl, the flour, baking soda, baking powder, cocoa powder and sea salt. Set aside. WHISK (in a separate bowl) together the eggs, yolk, sugars and vanilla. Add the butter mixture and whisk until smooth. ADD the flour mixture and Greek yogurt, mix until just combined. ADD coffee. Make sure to not over mix! FILL the liners with the cupcake mixture. I filled my liners to the top, so they make really big, beautiful cupcakes. BAKE for 18-20 minutes, depending on your oven (I use a toothpick to make sure the center is cooked through). Cool completely. PUREE blackberries using a food processor blender. Then use a fine mesh strainer to strain puree into a small bowl, until only seeds remain in the strainer. I used a small spatula to push the puree through the strainer. MIX in a large bowl, (use a hand mixer or a stand mixer) to whisk together the butter, powdered sugar, and salt until combined. Once the mixture is combined (around 3-5 minutes), add cream cheese. Mix until fluffy and smooth. ADD blackberry puree and mix until incorporated. Transfer frosting to a gallon Ziploc bag and refrigerate for about 30 minutes. When cupcakes are cooled, remove them from the baking pan. Decorate by cutting off the tip of your Ziploc bag (for easy frosting), then top with a blackberry for garnish!